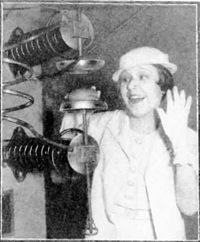 The exploitation of high-frequency radio waves for heating substances was made possible by the development of vacuum tube radio transmitters around 1920. By 1930 the application of short waves to heat human tissue had developed into the medical therapy of diathermy. 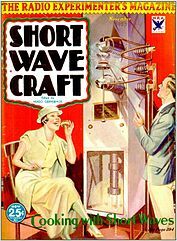 At the 1933 Chicago World's Fair, Westinghouse demonstrated the cooking of foods between two metal plates attached to a 10 kW, 60 MHz shortwave transmitter. The Westinghouse team, led by I. F. Mouromtseff, found that foods like steaks and potatoes could be cooked in minutes. This invention relates to heating systems for dielectric materials and the object of the invention is to heat such materials uniformly and substantially simultaneously throughout their mass. ... It has been proposed therefore to heat such materials simultaneously throughout their mass by means of the dielectric loss produced in them when they are subjected to a high voltage, high frequency field. However, lower-frequency dielectric heating, as described in the aforementioned patent, is (like induction heating) an electromagnetic heating effect, the result of the so-called near-field effects that exist in an electromagnetic cavity that is small compared with the wavelength of the electromagnetic field. This patent proposed radio frequency heating, at 10 to 20 megahertz (wavelength 15 to 30 meters). Heating from microwaves that have a wavelength that is small relative to the cavity (as in a modern microwave oven) is due to "far-field" effects that are due to classical electromagnetic radiation that describes freely propagating light and microwaves suitably far from their source. Nevertheless, the primary heating effect of all types of electromagnetic fields at both radio and microwave frequencies occurs via the dielectric heating effect, as polarized molecules are affected by a rapidly alternating electric field. The invention of the cavity magnetron made possible the production of electromagnetic waves of a small enough wavelength (microwaves). The magnetron was originally a crucial component in the development of short wavelength radar during World War II. 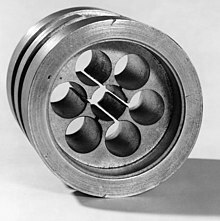 In 1937–1940, a multi-cavity magnetron was built by the British physicist Sir John Turton Randall, FRSE, together with a team of British coworkers, for the British and American military radar installations in World War II. A more high-powered microwave generator that worked at shorter wavelengths was needed, and in 1940, at the University of Birmingham in England, Randall and Harry Boot produced a working prototype. 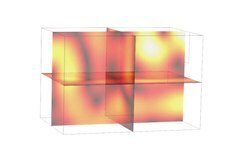 They invented a valve that could spit out pulses of microwave radio energy on a wavelength of 10 cm, an unprecedented discovery. Sir Henry Tizard travelled to the U.S. in late September 1940 to offer the magnetron in exchange for their financial and industrial help (see Tizard Mission). An early 6 kW version, built in England by the General Electric Company Research Laboratories, Wembley, London, was given to the U.S. government in September 1940. The magnetron was later described by American historian James Phinney Baxter III as "[t]he most valuable cargo ever brought to our shores". Contracts were awarded to Raytheon and other companies for mass production of the magnetron. In 1945, the specific heating effect of a high-power microwave beam was accidentally discovered by Percy Spencer, an American self-taught engineer from Howland, Maine. Employed by Raytheon at the time, he noticed that microwaves from an active radar set he was working on started to melt a chocolate bar he had in his pocket. The first food deliberately cooked with Spencer's microwave was popcorn, and the second was an egg, which exploded in the face of one of the experimenters. To verify his finding, Spencer created a high density electromagnetic field by feeding microwave power from a magnetron into a metal box from which it had no way to escape. When food was placed in the box with the microwave energy, the temperature of the food rose rapidly. On 8 October 1945, Raytheon filed a United States patent application for Spencer's microwave cooking process, and an oven that heated food using microwave energy from a magnetron was soon placed in a Boston restaurant for testing. In 1947, Raytheon built the "Radarange", the first commercially available microwave oven. It was almost 1.8 metres (5 ft 11 in) tall, weighed 340 kilograms (750 lb) and cost about US$5,000 ($56,000 in 2018 dollars) each. It consumed 3 kilowatts, about three times as much as today's microwave ovens, and was water-cooled. The name was the winning entry in an employee contest. An early Radarange was installed (and remains) in the galley of the nuclear-powered passenger/cargo ship NS Savannah. An early commercial model introduced in 1954 consumed 1.6 kilowatts and sold for US$2,000 to US$3,000 ($19,000 to $28,000 in 2018 dollars). Raytheon licensed its technology to the Tappan Stove company of Mansfield, Ohio in 1952. They tried to market a large 220 volt wall unit as a home microwave oven in 1955 for a price of US$1,295 ($12,000 in 2018 dollars), but it did not sell well. Japan's Sharp Corporation began manufacturing microwave ovens in 1961. Between 1964 and 1966, Sharp introduced the first microwave oven with a turntable, a feature that promotes convenient even heating of food. In 1965, Raytheon acquired Amana. In 1967, they introduced the first popular home model, the countertop Radarange, at a price of US$495 ($4,000 in 2018 dollars). In the 1960s,[specify] Litton bought Studebaker's Franklin Manufacturing assets, which had been manufacturing magnetrons and building and selling microwave ovens similar to the Radarange. Litton then developed a new configuration of the microwave: the short, wide shape that is now common. The magnetron feed was also unique. This resulted in an oven that could survive a no-load condition: an empty microwave oven where there is nothing to absorb the microwaves. The new oven was shown at a trade show in Chicago, and helped begin a rapid growth of the market for home microwave ovens. Sales volume of 40,000 units for the U.S. industry in 1970 grew to one million by 1975. Market penetration was faster in Japan, due to a re-engineered magnetron allowing for less expensive units. Several other companies joined in the market, and for a time most systems were built by defense contractors, who were most familiar with the magnetron. Litton was particularly well known in the restaurant business. By 1972, Litton (Litton Atherton Division, Minneapolis) introduced two new microwave ovens, priced at $349 and $399, to tap into the market estimated at $750 million by 1976, according to Robert I Bruder, president of the division. 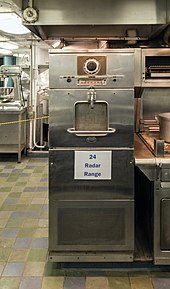 1971 Radar Range RR-4. By the late 1970s, technological advances led to rapidly falling prices. Often called "electronic ovens" in the 1960s, the name "microwave oven" later gained currency, and they are now informally called "microwaves". From the late 1970s, Japanese companies such as Sharp Corporation manufactured low-cost microwave ovens that were affordable for residential use, leading to the rapid expansion of the microwave oven market in the 1980s. 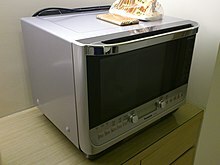 After Japanese dominance for much of the 1980s, with Sharp as market leader, South Korean manufacturers began entering the market in the late 1980s, with Samsung becoming a major microwave manufacturer. Formerly found only in large industrial applications, microwave ovens increasingly became a standard fixture of residential kitchens in developed countries. By 1986, roughly 25% of households in the U.S. owned a microwave oven, up from only about 1% in 1971; the U.S. Bureau of Labor Statistics reported that over 90% of American households owned a microwave oven in 1997. In Australia, a 2008 market research study found that 95% of kitchens contained a microwave oven and that 83% of them were used daily. In Canada, fewer than 5% of households had a microwave oven in 1979, but more than 88% of households owned one by 1998. In France, 40% of households owned a microwave oven in 1994, but that number had increased to 65% by 2004. Adoption has been slower in less-developed countries, as households with disposable income concentrate on more important household appliances like refrigerators and ovens. In India, for example, only about 5% of households owned a microwave in 2013, well behind refrigerators at 31% ownership. However, microwave ovens are gaining popularity. In Russia, for example, the number of households with a microwave grew from almost 24% in 2002 to almost 40% in 2008. Almost twice as many households in South Africa owned microwaves in 2008 (38.7%) as in 2002 (19.8%). Microwave ownership in Vietnam was at 16% of households in 2008—versus 30% ownership of refrigerators; this rate was up significantly from 6.7% microwave ownership in 2002, with 14% ownership for refrigerators that year. A microwave oven heats food by passing microwave radiation through it. Microwaves are a form of non-ionizing electromagnetic radiation with a frequency higher than ordinary radio waves but lower than infrared light. Microwave ovens use frequencies in one of the ISM (industrial, scientific, medical) bands, which are reserved for this use, so they do not interfere with other vital radio services. Consumer ovens usually use 2.45 gigahertz (GHz)— It is a wavelength of 12.2 centimetres (4.80 in)—while large industrial/commercial ovens often use 915 megahertz (MHz)—32.8 centimetres (12.9 in). Water, fat, and other substances in the food absorb energy from the microwaves in a process called dielectric heating. Many molecules (such as those of water) are electric dipoles, meaning that they have a partial positive charge at one end and a partial negative charge at the other, and therefore rotate as they try to align themselves with the alternating electric field of the microwaves. Rotating molecules hit other molecules and put them into motion, thus dispersing energy. This energy, dispersed as molecular rotations, vibrations and/or translations in solids and liquids raises the temperature of the food, in a process similar to heat transfer by contact with a hotter body It is a common misconception that microwave ovens heat food by operating at a special resonance of water molecules in the food. As noted microwave ovens can operate at many frequencies. Microwave heating is more efficient on liquid water than on frozen water, where the movement of molecules is more restricted. Dielectric heating of liquid water is also temperature-dependent: At 0 °C, dielectric loss is greatest at a field frequency of about 10 GHz, and for higher water temperatures at higher field frequencies. Compared to liquid water, microwave heating is less efficient on fats and sugars (which have a smaller molecular dipole moment). Sugars and triglycerides (fats and oils) absorb microwaves due to the dipole moments of their hydroxyl groups or ester groups. However, due to the lower specific heat capacity of fats and oils and their higher vaporization temperature, they often attain much higher temperatures inside microwave ovens. This can induce temperatures in oil or very fatty foods like bacon far above the boiling point of water, and high enough to induce some browning reactions, much in the manner of conventional broiling (UK: grilling), braising, or deep fat frying. Foods high in water content and with little oil rarely exceed the boiling temperature of water. Microwave heating can cause localized thermal runaways in some materials with low thermal conductivity which also have dielectric constants that increase with temperature. An example is glass, which can exhibit thermal runaway in a microwave to the point of melting if preheated. Additionally, microwaves can melt certain types of rocks, producing small quantities of molten rock. Some ceramics can also be melted, and may even become clear upon cooling. Thermal runaway is more typical of electrically conductive liquids such as salty water. Another misconception is that microwave ovens cook food "from the inside out", meaning from the center of the entire mass of food outwards. This idea arises from heating behavior seen if an absorbent layer of water lies beneath a less absorbent drier layer at the surface of a food; in this case, the deposition of heat energy inside a food can exceed that on its surface. This can also occur if the inner layer has a lower heat capacity than the outer layer causing it to reach a higher temperature, or even if the inner layer is more thermally conductive than the outer layer making it feel hotter despite having a lower temperature. In most cases, however, with uniformly structured or reasonably homogenous food item, microwaves are absorbed in the outer layers of the item at a similar level to that of the inner layers. Depending on water content, the depth of initial heat deposition may be several centimetres or more with microwave ovens, in contrast to broiling/grilling (infrared) or convection heating—methods which deposit heat thinly at the food surface. Penetration depth of microwaves is dependent on food composition and the frequency, with lower microwave frequencies (longer wavelengths) penetrating further. a turntable or metal wave guide stirring fan. In most ovens, the magnetron is driven by a linear transformer which can only feasibly be switched completely on or off. (One variant of the GE Spacemaker had two taps on the transformer primary, for high and low power modes.) Usually choice of power level doesn't affect intensity of the microwave radiation; instead, the magnetron is cycled on and off every few seconds, thus altering the large scale duty cycle. Newer models use inverter power supplies that use pulse-width modulation to provide effectively continuous heating at reduced power settings, so that foods are heated more evenly at a given power level and can be heated more quickly without being damaged by uneven heating. The microwave frequencies used in microwave ovens are chosen based on regulatory and cost constraints. The first is that they should be in one of the industrial, scientific, and medical (ISM) frequency bands set aside for unlicensed purposes. For household purposes, 2.45 GHz has the advantage over 915 MHz in that 915 MHz is only an ISM band in the ITU Region 2 while 2.45 GHz is available worldwide. [vague] Three additional ISM bands exist in the microwave frequencies, but are not used for microwave cooking. Two of them are centered on 5.8 GHz and 24.125 GHz, but are not used for microwave cooking because of the very high cost of power generation at these frequencies. The third, centered on 433.92 MHz, is a narrow band that would require expensive equipment to generate sufficient power without creating interference outside the band, and is only available in some countries. The cooking chamber is similar to a Faraday cage to prevent the waves from coming out of the oven. Even though there is no continuous metal-to-metal contact around the rim of the door, choke connections on the door edges act like metal-to-metal contact, at the frequency of the microwaves, to prevent leakage. The oven door usually has a window for easy viewing, with a layer of conductive mesh some distance from the outer panel to maintain the shielding. Because the size of the perforations in the mesh is much less than the microwaves' wavelength (12.2 cm for the usual 2.45 GHz), microwave radiation cannot pass through the door, while visible light (with its much shorter wavelength) can. Modern microwave ovens use either an analog dial-type timer or a digital control panel for operation. Control panels feature an LED, liquid crystal or vacuum fluorescent display, in the 90s brands such as Panasonic and GE began offering models with a scrolling-text display showing cooking instructions, numeric buttons for entering the cook time, a power level selection feature and other possible functions such as a defrost setting and pre-programmed settings for different food types, such as meat, fish, poultry, vegetables, frozen vegetables, frozen dinners, and popcorn. Power settings are commonly implemented, not by actually varying the effect, but by repeatedly turning the power off and on. The highest setting thus represents continuous power. Defrost might represent power for two seconds followed by no power for five seconds. An audible warning such as a bell or a beeper is usually present to indicate that cooking has completed. Microwave control panels are often considered awkward to use and are frequently employed as examples for user interface design. 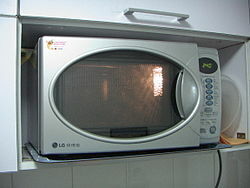 A variant of the conventional microwave is the convection microwave. A convection microwave oven is a combination of a standard microwave and a convection oven. It allows food to be cooked quickly, yet come out browned or crisped, as from a convection oven. Convection microwaves are more expensive than conventional microwave ovens. Some convection microwaves—those with exposed heating elements—can produce smoke and burning odors as food spatter from earlier microwave-only use is burned off the heating elements. In 2000, some manufacturers began offering high power quartz halogen bulbs to their convection microwave models, marketing them under names such as "Speedcook", "Advantium", "Lightwave" and "Optimawave" to emphasize their ability to cook food rapidly and with good browning. The bulbs heat the food's surface with infrared (IR) radiation, browning surfaces as in a conventional oven. The food browns while also being heated by the microwave radiation and heated through conduction through contact with heated air. The IR energy which is delivered to the outer surface of food by the lamps is sufficient to initiate browning caramelization in foods primarily made up of carbohydrates and Maillard reactions in foods primarily made up of protein. These reactions in food produce a texture and taste similar to that typically expected of conventional oven cooking rather than the bland boiled and steamed taste that microwave-only cooking tends to create. In order to aid browning, sometimes an accessory browning tray is used, usually composed of glass or porcelain. It makes food crisp by oxidizing the top layer until it turns brown. Ordinary plastic cookware is unsuitable for this purpose because it could melt. Frozen dinners, pies, and microwave popcorn bags often contain a susceptor made from thin aluminium film in the packaging or included on a small paper tray. The metal film absorbs microwave energy efficiently and consequently becomes extremely hot and radiates in the infrared, concentrating the heating of oil for popcorn or even browning surfaces of frozen foods. Heating packages or trays containing susceptors are designed for a single use and are then discarded as waste. In addition to their use in heating food, microwave ovens are widely used for heating in industrial processes. 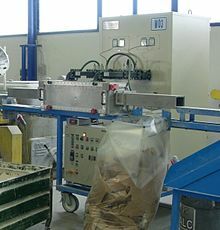 A microwave tunnel oven for softening plastic rods prior to extrusion. 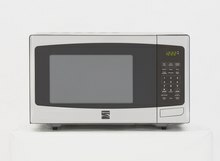 Microwave ovens produce heat directly within the food, but despite the common misconception that microwaved food cooks from the inside out, 2.45 GHz microwaves can only penetrate approximately 1 centimeter (0.39 in) into most foods. The inside portions of thicker foods are mainly heated by heat conducted from the outer 1 centimeter (0.39 in). Uneven heating in microwaved food can be partly due to the uneven distribution of microwave energy inside the oven, and partly due to the different rates of energy absorption in different parts of the food. The first problem is reduced by a stirrer, a type of fan that reflects microwave energy to different parts of the oven as it rotates, or by a turntable or carousel that turns the food; turntables, however, may still leave spots, such as the center of the oven, which receive uneven energy distribution. The location of dead spots and hot spots in a microwave can be mapped out by placing a damp piece of thermal paper in the oven. When the water saturated paper is subjected to the microwave radiation it becomes hot enough to cause the dye to be released which will provide a visual representation of the microwaves. If multiple layers of paper are constructed in the oven with a sufficient distance between them a three-dimensional map can be created. Many store receipts are printed on thermal paper which allows this to be easily done at home. The second problem is due to food composition and geometry, and must be addressed by the cook, by arranging the food so that it absorbs energy evenly, and periodically testing and shielding any parts of the food that overheat. In some materials with low thermal conductivity, where dielectric constant increases with temperature, microwave heating can cause localized thermal runaway. Under certain conditions, glass can exhibit thermal runaway in a microwave to the point of melting. Due to this phenomenon, microwave ovens set at too-high power levels may even start to cook the edges of frozen food while the inside of the food remains frozen. Another case of uneven heating can be observed in baked goods containing berries. In these items, the berries absorb more energy than the drier surrounding bread and cannot dissipate the heat due to the low thermal conductivity of the bread. Often this results in overheating the berries relative to the rest of the food. "Defrost" oven settings either use low power levels or turn the power off and on repeatedly - designed to allow time for heat to be conducted within frozen foods from areas that absorb heat more readily to those which heat more slowly. In turntable-equipped ovens, more even heating will take place by placing food off-centre on the turntable tray instead of exactly in the centre, so that no part of the food item will be continuously unheated by the center "dead zone". There are microwave ovens on the market that allow full-power defrosting. They do this by exploiting the properties of the electromagnetic radiation LSM modes. LSM full-power defrosting may actually achieve more even results than slow defrosting. Microwave heating can be deliberately uneven by design. Some microwavable packages (notably pies) may include materials that contain ceramic or aluminium flakes, which are designed to absorb microwaves and heat up, which aids in baking or crust preparation by depositing more energy shallowly in these areas. Such ceramic patches affixed to cardboard are positioned next to the food, and are typically smokey blue or gray in colour, usually making them easily identifiable; the cardboard sleeves included with Hot Pockets, which have a silver surface on the inside, are a good example of such packaging. Microwavable cardboard packaging may also contain overhead ceramic patches which function in the same way. The technical term for such a microwave-absorbing patch is a susceptor. Any form of cooking will destroy some nutrients in food, but the key variables are how much water is used in the cooking, how long the food is cooked, and at what temperature. Nutrients are primarily lost by leaching into cooking water, which tends to make microwave cooking healthier, given the shorter cooking times it requires. Like other heating methods, microwaving converts vitamin B12 from an active to inactive form; the amount of conversion depends on the temperature reached, as well as the cooking time. Boiled food reaches a maximum of 100 °C (212 °F) (the boiling point of water), whereas microwaved food can get locally hotter than this, leading to faster breakdown of vitamin B12. The higher rate of loss is partially offset by the shorter cooking times required. Spinach retains nearly all its folate when cooked in a microwave; in comparison, it loses about 77% when boiled, leaching out nutrients. Bacon cooked by microwave has significantly lower levels of carcinogenic nitrosamines than conventionally cooked bacon. Steamed vegetables tend to maintain more nutrients when microwaved than when cooked on a stovetop. Microwave blanching is 3–4 times more effective than boiled water blanching in the retaining of the water-soluble vitamins folic acid, thiamin and riboflavin, with the exception of ascorbic acid, of which 28.8% is lost (vs. 16% with boiled water blanching). Microwaving human milk at high temperatures is not recommended as it causes a marked decrease in activity of anti-infective factors. All microwaves use a timer for the cooking time, at the end of cooking time, the oven switches itself off. Microwave ovens heat food without getting hot themselves. Taking a pot off a stove, unless it is an induction cooktop, leaves a potentially dangerous heating element or trivet that will stay hot for some time. Likewise, when taking a casserole out of a conventional oven, one's arms are exposed to the very hot walls of the oven. A microwave oven does not pose this problem. The lower temperature of cooking (the boiling point of water) is a significant safety benefit compared to baking in the oven or frying, because it eliminates the formation of tars and char, which are carcinogenic. Microwave radiation also penetrates deeper than direct heat, so that the food is heated by its own internal water content. In contrast, direct heat can burn the surface while the inside is still cold. Pre-heating the food in a microwave oven before putting it into the grill or pan reduces the time needed to heat up the food and reduces the formation of carcinogenic char. Unlike frying and baking, microwaving does not produce acrylamide in potatoes, however unlike deep-frying, it is of only limited effectiveness in reducing glycoalkaloid (i.e., solanine) levels. Acrylamide has been found in other microwaved products like popcorn. Studies have investigated the use of the microwave to clean non-metallic domestic sponges which have been thoroughly wetted. A 2006 study found that microwaving wet sponges for two minutes (at 1000 watt power) removed 99% of coliforms, E. coli and MS2 phages. Bacillus cereus spores were killed at four minutes of microwaving. A 2017 study was less affirmative: about 60% of the germs were killed but the remaining ones quickly re-colonized the sponge. Water and other homogeneous liquids can superheat when heated in a microwave oven in a container with a smooth surface. That is, the liquid reaches a temperature slightly above its normal boiling point without bubbles of vapour forming inside the liquid. The boiling process can start explosively when the liquid is disturbed, such as when the user takes hold of the container to remove it from the oven or while adding solid ingredients such as powdered creamer or sugar. This can result in spontaneous boiling (nucleation) which may be violent enough to eject the boiling liquid from the container and cause severe scalding. Closed containers, such as eggs, can explode when heated in a microwave oven due to the increased pressure from steam. Intact fresh egg yolks outside the shell will also explode, as a result of superheating. Insulating plastic foams of all types generally contain closed air pockets, and are generally not recommended for use in a microwave, as the air pockets explode and the foam (which can be toxic if consumed) may melt. Not all plastics are microwave-safe, and some plastics absorb microwaves to the point that they may become dangerously hot. Products that are heated for too long can catch fire. Though this is inherent to any form of cooking, the rapid cooking and unattended nature of the use of microwave ovens results in additional hazard. Any metal or conductive object placed into the microwave will act as an antenna to some degree, resulting in an electric current. This causes the object to act as a heating element. This effect varies with the object's shape and composition, and is sometimes utilized for cooking. It is possible for metal objects to be microwave-oven compatible, although experimentation by users is not encouraged. Microwaving an individual smooth metal object without pointed ends, for example, a spoon or shallow metal pan, usually does not produce sparking. Thick metal wire racks can be part of the interior design in microwave ovens (see illustration). In a similar way, the interior wall plates with perforating holes which allow light and air into the oven, and allow interior-viewing through the oven door, are all made of conductive metal formed in a safe shape. The effect of microwaving thin metal films can be seen clearly on a Compact Disc or DVD (particularly the factory pressed type). The microwaves induce electric currents in the metal film, which heats up, melting the plastic in the disc and leaving a visible pattern of concentric and radial scars. Similarly, porcelain with thin metal films can also be destroyed or damaged by microwaving. Aluminium foil is thick enough to be used in microwave ovens as a shield against heating parts of food items, if the foil is not badly warped. When wrinkled, aluminium foil is generally unsafe in microwaves, as manipulation of the foil causes sharp bends and gaps that invite sparking. The USDA recommends that aluminium foil used as a partial food shield in microwave cooking cover no more than one quarter of a food object, and be carefully smoothed to eliminate sparking hazards. Another hazard is the resonance of the magnetron tube itself. If the microwave is run without an object to absorb the radiation, a standing wave will form. 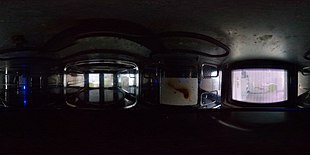 The energy is reflected back and forth between the tube and the cooking chamber. This may cause the tube to overload and burn out. High reflected power may also cause magnetron arcing, possibly resulting in primary power fuse failure, though such a causal relationship isn't easily established. Thus, dehydrated food, or food wrapped in metal which does not arc, is problematic for overload reasons, without necessarily being a fire hazard. Certain foods such as grapes, if properly arranged, can produce an electric arc. Prolonged arcing from food carries similar risks to arcing from other sources as noted above. Some other objects that may conduct sparks are plastic/holographic print thermoses (such as Starbucks novelty cups) or cups with metal lining. If any bit of the metal is exposed, all the outer shell will burst off the object or melt. The high electrical fields generated inside a microwave often can be illustrated by placing a radiometer or neon glow-bulb inside the cooking chamber, creating glowing plasma inside the low-pressure bulb of the device. Direct microwave exposure is not generally possible, as microwaves emitted by the source in a microwave oven are confined in the oven by the material out of which the oven is constructed. Furthermore, ovens are equipped with redundant safety interlocks, which remove power from the magnetron if the door is opened. This safety mechanism is required by United States federal regulations. Tests have shown confinement of the microwaves in commercially available ovens to be so nearly universal as to make routine testing unnecessary. According to the United States Food and Drug Administration's Center for Devices and Radiological Health, a U.S. Federal Standard limits the amount of microwaves that can leak from an oven throughout its lifetime to 5 milliwatts of microwave radiation per square centimeter at approximately 5 cm (2 in) from the surface of the oven. This is far below the exposure level currently considered to be harmful to human health. The radiation produced by a microwave oven is non-ionizing. It therefore does not have the cancer risks associated with ionizing radiation such as X-rays and high-energy particles. Long-term rodent studies to assess cancer risk have so far failed to identify any carcinogenicity from 2.45 GHz microwave radiation even with chronic exposure levels (i.e. large fraction of life span) far larger than humans are likely to encounter from any leaking ovens. However, with the oven door open, the radiation may cause damage by heating. Every microwave oven sold has a protective interlock so that it cannot be run when the door is open or improperly latched. Microwaves generated in microwave ovens cease to exist once the electrical power is turned off. They do not remain in the food when the power is turned off, any more than light from an electric lamp remains in the walls and furnishings of a room when the lamp is turned off. They do not make the food or the oven radioactive. Compared to conventional cooking, the nutritional content of some foods may be altered differently, but generally in a positive way by preserving more micronutrients - see above. There is no indication of detrimental health issues associated with microwaved food. There are, however, a few cases where people have been exposed to direct microwave radiation, either from appliance malfunction or deliberate action. The general effect of this exposure will be physical burns to the body, as human tissue, particularly the outer fat and muscle layers, has similar composition to some foods that are typically cooked in microwave ovens and so experiences similar dielectric heating effects when exposed to microwave electromagnetic radiation. 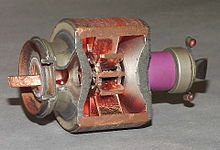 Some magnetrons have ceramic insulators with beryllium oxide (beryllia) added. The beryllium in such oxides is a serious chemical hazard if crushed then inhaled or ingested. In addition, beryllia is listed as a confirmed human carcinogen by the IARC; therefore, broken ceramic insulators or magnetrons should not be handled. This is a danger if the microwave oven becomes physically damaged, if the insulator cracks, or when the magnetron is opened and handled, yet not during normal usage. The use of unmarked plastics for microwave cooking raises the issue of plasticizers leaching into the food, or the plastics chemically reacting to microwave energy, with by-products leaching into the food, suggesting that even plastic containers marked "microwavable" may still leach plastic by-products into the food. The plasticizers which received the most attention are bisphenol A (BPA) and phthalates, although it is unclear whether other plastic components present a toxicity risk. Other issues include melting and flammability. An alleged issue of release of dioxins into food has been dismissed as an intentional red herring distraction from actual safety issues. Some current plastic containers and food wraps are specifically designed to resist radiation from microwaves. Products may use the term "microwave safe", may carry a microwave symbol (three lines of waves, one above the other) or simply provide instructions for proper microwave use. Any of these is an indication that a product is suitable for microwaving when used in accordance with the directions provided. Microwave ovens are frequently used for reheating leftover food, and bacterial contamination may not be repressed if the safe temperature is not reached, resulting in foodborne illness, as with all inadequate reheating methods. While microwaves can destroy bacteria as well as conventional ovens, they do not cook as evenly, leading to an increased risk that parts of the food will not reach recommended temperatures. Microwave ovens, although shielded for safety purposes, still emit low levels of microwave radiation. This is not harmful to humans, but can sometimes cause interference to Wi-Fi and Bluetooth and other devices that communicate on the 2.45 GHz wavebands; particularly at close range. Some microwaves have a "grill" feature that heats a plate or rack to high temperature to sear the outside of food. Some have dual microwave and convection oven functionality, leaving microwave-only appliances to be described as "solo" microwaves. ^ "Microwave Oven". Encyclopedia Brittanica. 26 October 2018. Retrieved 19 January 2019. ^ This, Hervé (1995). Révélations gastronomiques (in French). Éditions Belin. ISBN 978-2-7011-1756-0. ^ "The Magnetron". Radar Recollections - A Bournemouth University/CHiDE/HLF project. Defence Electronics History Society (formerly CHiDE). ^ a b c "Briefcase 'that changed the world'". BBC. 20 October 2017. ^ Willshaw, W. E.; L. Rushforth; A. G. Stainsby; R. Latham; A. W. Balls; A. H. King (1946). "The High-power Pulsed Magnetron: Development and Design for Radar Applications". The Journal of the Institution of Electrical Engineers — Part IIIA: Radiolocation. 93 (5): 985–1005. doi:10.1049/ji-3a-1.1946.0188. Retrieved 22 June 2012. ^ Baxter, James Phinney III (1946). Scientists Against Time. Boston: Little, Brown, and Co. p. 142. ^ "Technology Leadership". Raytheon. Archived from the original on 22 March 2013. ^ Gallawa, J Carlton (1989). "A Brief History of the Microwave Oven". The complete microwave oven service handbook : operation, maintenance, troubleshooting, and repair. Englewood Cliffs, N.J.: Prentice Hall. ISBN 9780131620179. OCLC 18559256. Retrieved 11 October 2017. Chapter link is hosted at the Southwest Museum of Engineering, Communication and Computation; Glendale, Arizona. ^ "History of Sharp". Sharp Corporation. Retrieved 26 June 2018. ^ Litton Introduces Microwave Ovens. New York Times, 14 July 1972, p. 38. ^ Schnaars, Steven P. (2002). Managing Imitation Strategies. Simon & Schuster. p. 161. ISBN 9781439106372. ^ Williams, Cara (Winter 2000). "Income and expenditures" (PDF). Canadian Social Trends — Catalogue No. 11-008 (59): 7–12. Microwaves have been adopted even more avidly: in 1979, less than 5% of households had one, but by 1998 over 88% did. ^ "Household penetration rate of home appliances in India in 2013". Statistica. Retrieved 5 February 2015. ^ "Litton — For Heat, Tune to 915 or 2450 Megacycles". Litton Industries, 1965. Southwest Museum of Engineering, Communications and Computation. 2007. Retrieved 12 December 2006. ^ Zitzewitz, Paul W. (1 February 2011). The Handy Physics Answer Book. Visible Ink Press. ISBN 9781578593576. ^ Bloomfield, Louis. "Question 1456". How Everything Works. Archived from the original on 17 October 2017. Retrieved 9 February 2012. ^ a b Chaplin, Martin (28 May 2012). "Water and Microwaves". Water Structure and Science. London South Bank University. Retrieved 4 December 2012. ^ "Efficient" here meaning more energy is deposited, not necessarily that the temperature rises more, because the latter also is a function of the specific heat capacity, which is often less than water for most substances. For a practical example, milk heats slightly faster than water in a microwave oven, but only because milk solids have less heat capacity than the water they replace. ^ Jerby, Eli; Meir, Yehuda; Faran, Mubarak (September 2013). Basalt Melting by Localized-Microwave Thermal-Runaway Instability (PDF). 14th International Conference on Microwave and High Frequency Heating, AMPERE-2013. Nottingham, UK. doi:10.13140/2.1.4346.1126. ^ "What Is a Microwave Inverter?". Reference.com. Retrieved 10 May 2018. ^ "What's an Inverter?". Panasonic.com. Retrieved 10 May 2018. ^ "A notable advance in microwave technology". The Telegram. 22 September 2013. Retrieved 10 May 2018. ^ "User Interfaces: Why are Microwave Ovens All So Difficult to Use?". The Guardian. 13 July 2015. Retrieved 4 January 2019. ^ Fabricant, Florence (27 September 2000). "Son of Microwave: Fast and Crisp". The New York Times. Retrieved 6 January 2015. ^ "Microwave Technology Penetration Depths". pueschner.com. Püschner GMBH + CO KG MicrowavePowerSystems. Retrieved 1 June 2018. ^ Health, Center for Devices and Radiological (12 December 2017). "Resources for You (Radiation-Emitting Products) - Microwave Oven Radiation". fda.gov. U.S. Food and Drug Administration. Retrieved 1 June 2018. ^ Rutgers, Maarten (1999). "Physics inside a Microwave Oven". Finding the hot spots in your microwave with fax paper. Archived from the original on 20 July 2003. ^ P Risman, "Advanced topics in microwave heating uniformity", pp. 76-77, in, M W Lorence, P S Pesheck (eds), Development of Packaging and Products for Use in Microwave Ovens, Elsevier, 2009 ISBN 1845696573. ^ Labuza, T; Meister (1992). "An Alternate Method for Measuring the Heating Potential of Microwave Susceptor Films" (PDF). J. International Microwave Power and Electromagnetic Energy. 27 (4): 205–208. doi:10.1080/08327823.1992.11688192. Archived from the original (PDF) on 4 November 2011. Retrieved 23 September 2011. ^ a b c O'Connor, Anahad (17 October 2006). "The Claim: Microwave Ovens Kill Nutrients in Food". The New York Times. ^ "Microwave cooking and nutrition". Family Health Guide. Harvard Medical School. Archived from the original on 17 July 2011. Retrieved 23 July 2011. ^ Fumio Watanabe; Katsuo Abe; Tomoyuki Fujita; Mashahiro Goto; Miki Hiemori; Yoshihisa Nakano (January 1998). "Effects of Microwave Heating on the Loss of Vitamin B(12) in Foods". Journal of Agricultural and Food Chemistry. 46 (1): 206–210. doi:10.1021/jf970670x. PMID 10554220. ^ OSINBOYEJO, M. A.; Walker, L. T.; Ogutu, S. & Verghese, M. "Effects of Microwave Blanching vs. Boiling Water Blanching on Retention of Selected Water-Soluble Vitamins in Turnips, Foods, and Greens Using HPLC". National Center for Home Food Preservation, University of Georgia. Retrieved 23 July 2011. ^ Quan, R.; Yang, C.; Rubinstein, S. (April 1992). "Effects of microwave radiation on anti-infective factors in human milk". Pediatrics. 89 (4 Pt 1): 667–9. PMID 1557249. ^ "The Five Worst Foods to Grill". Physicians Committee for Responsible Medicine. 2005. Archived from the original on 30 December 2010. ^ Taché, J.; Carpentier, B. (January 2014). "Hygiene in the home kitchen: Changes in behaviour and impact of key microbiological hazard control measures". Food Control. 35 (1): 392–400. doi:10.1016/j.foodcont.2013.07.026. ^ Egert, Markus; Schnell, Sylvia; Lueders, Tillmann; Kaiser, Dominik; Cardinale, Massimiliano (19 July 2017). "Microbiome analysis and confocal microscopy of used kitchen sponges reveal massive colonization by Acinetobacter, Moraxella and Chryseobacterium species". Nature. 7 (1): 5791. doi:10.1038/s41598-017-06055-9. PMC 5517580. PMID 28725026. ^ "Superheating and microwave ovens". School of Physics. University of New South Wales. Retrieved 25 October 2010. ^ Beaty, William J. "High Voltage in your Kitchen: Unwise Microwave Oven Experiments". Amasci.com. Retrieved 21 January 2006. ^ List of microwave safe and unsafe items. Archived 30 March 2012 at the Wayback Machine Accessed 25 October 2009. ^ "Microwave Ovens and Food Safety" (PDF). Food Safety and Inspection Service. United States Department of Agriculture. October 2011. Archived from the original (PDF) on 8 January 2011. Retrieved 10 August 2011. ^ Popa, Adrian (23 December 1997). "Re: Why do grapes spark in the microwave?". MadSci Network. Retrieved 23 February 2006. ^ 21 C.F.R. 1030.10 Retrieved 12 Aug 2014. ^ "Radiation Emissions from Microwave ovens: How safe are Microwave Ovens?". ARPANSA. Archived from the original on 6 March 2009. Retrieved 5 March 2009. ^ "Microwave Oven Radiation: Microwave Oven Safety Standard". U.S. Food and Drug Administration. 13 January 2010. Retrieved 16 February 2009. ^ "Advanced Measurements of Microwave Oven Leakage" (PDF). ARPANSA. 2004. Archived from the original (PDF) on 24 January 2011. Retrieved 8 January 2011. ^ Frei, MR; Jauchem, JR; Dusch, SJ; Merritt, JH; Berger, RE; Stedham, MA (1998). "Chronic, low-level (1.0 W/kg) exposure of mice prone to mammary cancer to 2450 MHz microwaves". Radiation Research. 150 (5): 568–76. doi:10.2307/3579874. JSTOR 3579874. PMID 9806599. ^ Frei, MR; Berger, RE; Dusch, SJ; Guel, V; Jauchem, JR; Merritt, JH; Stedham, MA (1998). "Chronic exposure of cancer-prone mice to low-level 2450 MHz radiofrequency radiation". Bioelectromagnetics. 19 (1): 20–31. doi:10.1002/(SICI)1521-186X(1998)19:1<20::AID-BEM2>3.0.CO;2-6. PMID 9453703. ^ "ARPANSA - Microwave Ovens and Health". Archived from the original on 6 March 2009. Retrieved 26 March 2015. ^ Frost, Joe L. (30 September 2001). Children and Injuries. Lawyers & Judges Publishing. p. 593. ISBN 978-0-913875-96-4. Retrieved 29 January 2011. ^ Geddesm, Leslie Alexander; Roeder, Rebecca A. (2006). Handbook of electrical hazards and accidents. Lawyers & Judges Publishing. pp. 369ff. ISBN 978-0-913875-44-5. ^ a b c "Microwaving food in plastic: Dangerous or not?". Harvard Health Publishing (Harvard U.). ^ "FAQs: Using Plastics in the Microwave". American Chemistry Council. ^ "Microwave Ovens and Food Safety". Food Safety and Inspection Service. United States Department of Agriculture. 8 August 2013. Retrieved 1 June 2018. ^ Kruszelnicki, Karl S. (25 September 2012). "WiFi frozen? Blame the microwave oven". ABC News and Current Affairs. Retrieved 19 January 2019.